Your Watertown Towne Cinema Needs YOU! 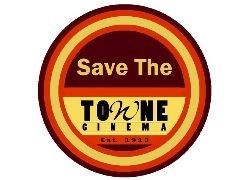 The Towne Cinema in Watertown will be forced to close it’s doors if the community, does not step up to help provide funding for new Digital Projectors. It is convert to digital or Die. BUT You can help! PLEASE Make a pledge Right Away through Kickstarter (see attached link) AND Make a Video! You could win a great prize, maybe be famous! Look what it did for Gangnum Style!! You could be the next big sensation! AND save YOUR Hometown theater! Starting TODAY and running through April 5th, the Cinema will be hosting a contest to bring out the director in you. Create a video and you could win Fabulous PRIZES & Save YOUR Theater! For more information please go right away to our the Towne Cinema Facebook Page and find out how to enter and WIN! Movies Inspire, Educate, Entertain. and Impact. Be part of the force that saves this historical Landmark and community gathering place in Watertown. "Never doubt that a small group of dedicated citizen's can change the world. Indeed, It's the only thing that ever has." - Margaret Mead. Total cost for conversion is $90 - $100,000. When the conversion is done - the movie experience will be wonderful for the theater goers, but without funding, the theater itself is dead. No more lines, marks, or scratches on the films we are showing. Have you watched a movie at our theater and saw a black or green line on the screen? That won't happen anymore! Limited-release movies that are distributed to the BIG THEATERS that we end up having to wait 4-8 weeks will no longer be a problem for us. There will be a new digital sound system in each theater. The picture itself will be brighter, cleaner, more visually pleasing to your eyes. Have we mentioned that barring any studio issues with our price, we're staying at $3 a ticket? Check Out the Town Cinema Facebook page for all of the up coming events! And GO RIGHT NOW TO KICKSTARTER AND MAKE YOUR PLEDE!